Enjoy all the Comforts of Home in our 3 bedroom/2 bathroom Lake View pool home located in a quiet residential area, away from the hustle and bustle, yet only minutes from the Magic of Disney and other area attractions. Our home is immaculately maintained and fully licensed. Florida living at it's best! Contact us for your SUNSHINE Vacation and stay in this beautiful Lake View home! Our Sunshine Home has a living room, dining room, family room, kitchen with breakfast bar. Relax in the heated pool at the end of your busy fun filled day and enjoy the private lake view! This location is ideal for guests expecting convenience and luxury, yet looking for good value. There is lots of privacy with the lake view, all of the amenities and more expected by your family are here! Golf and country clubs are located within 5 minutes drive. 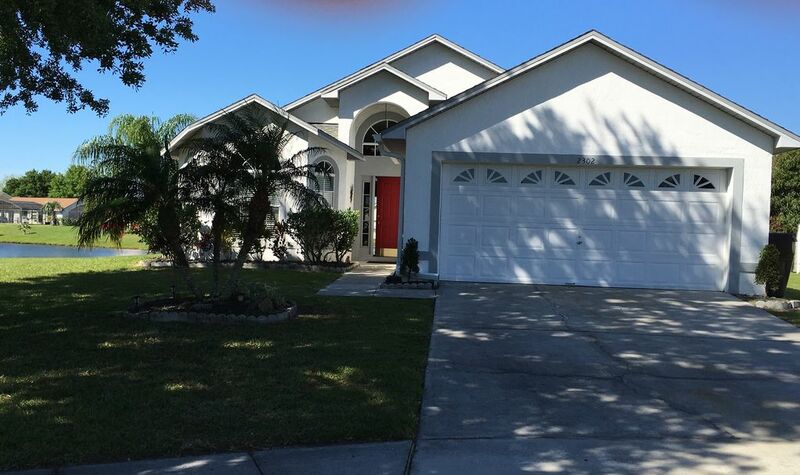 Easy access to the Orlando Airport (only 15 minutes away), and of course, Disney World and other area attractions, make this a very convenient Vacation Rental Home. WiFi Internet Access is available in this home. There is an Air Hockey Table and Pool Table in Garage!!!! In addition to the air-conditioning, ceiling fans are located in the family room, and all bedrooms. There are 4 cable TVs, a Flat Screen TV in the Family Room, a Flat Screen TV in the Master bedroom and the other Flat Screen TV is located in the Queen Bedroom and a Flat Screen TV in the twin Bed room. There is also a DVD player, and a selection of Disney and other Videos/DVD's for you. The living room has a sofa that opens to a bed. The family room has sliding doors that open from the family room to a lovely lake view and our fully screened-in private, heated pool. Pool side furniture of padded loungers, chairs, table and a gas grill complete the scene for your enjoyment. The kitchen is fully equipped and also has a dishwasher and microwave oven. All linens are provided as well as Cookware and utensils. The master bedroom has a king size bed, large walk-in closet, lamps, radio, Flat Screen cable TV, phone and en-suite bathroom with step in shower and an exit door leading to the pool area. The two additional bedrooms share a bathroom with a tub/shower combination and a lovely skylight. One bedroom is decorated in a Mickey theme and has twin beds and even a Mickey TV. The other bedroom is decorated in a fish theme and has a queen size bed and Flat Screen cable TV. Free use of Baby Pack n Play Bed, and high chair if requested at time of your booking. We are retired and enjoying the many adventures life brings to us. We live in the Northwest corner of Illinois but during the winter we are in our Florida home escaping the winter weather! When we are not using our home we like to share it with guests who want to enjoy the Wonderful Disney area and all of the many attraction in the area. We offer so much more than most of the other homes. We actually live in our home during the Winter and have included many, many more amenities than are available in most vacation homes!. This property is centrally located to all of the wonderful activities this area has to offer. Yes, you can fish in the pond, however, we recommend catch and release only. Beautiful view from the pool area. Free Phone calls anywhere in the US and Canada. All bed linens and towels, including pool towels are provided. Fully furnished with all dishes and cooking utensils that you would need. Full Kitchen with many extras! Many Disney and other videos are available for your families viewing pleasure. Table and chairs on the pool deck are available along with loungers as you enjoy the pool and wonderful Lake View. With Lake View. We recommend pool heat October - April. Our stay was comfortable, convenient and a welcome quiet refuge after visiting the busy Disney and Universal Parks. Your well appointed home delivered all the amenities you promised and was spotlessly clean. I would not hesitate to recommend this property to a friend and hope to stay again. The process of renting was also made easy thanks to a very reponsive home owner who answered questions and made the process simple. Thank you! Thank you for taking the time to write a review of our home. So happy you enjoyed your stay. We take great pride in our home and try to make everything as we would like to have it. Please let us know when you plan your next trip to the Disney area. AREA: Grocery stores, Restaurants, Fast Food, Stores and Shopping Malls are located just minutes away. Golf courses are plentiful and several are less than a 5 minutes drive away. ACTIVITIES: Swimming, Boating, Hiking, Fishing, Basketball, Tennis, Miniature Golf, Disney Theme Parks, Universal Studios, Sea World, plus many many more attractions. Free - Use of Tennis Courts, Basketball Courts, Skate Board Park and Children's play area at our Beautiful Lakeside Estates Park.